THE GOOD: The 2017 BMW M760i mixes a powerful engine with extraordinarily comfortable ride characteristics, including a system that examines the road ahead and adjusts the suspension. Its seamless connectivity features put useful items such as parking availability in the infotainment system. And it supports wireless Apple CarPlay. THE BAD: With average fuel economy rated at 16 mpg, the M760i earns a Gas Guzzler Tax. It doesn’t support Android Auto. THE BOTTOM LINE: As a top luxury sedan, the 2017 BMW M760i delivers an extraordinarily satisfying ride, and manages decent handling befitting its nameplate. Innovative technology smooths the ride and puts immediately useful information at your fingertips. Driving the big and powerful 2017 BMW M760i makes me feel like a success, as if I took a smart turn in life and now can have anything I want. It’s my personal Tony Robbins, giving me encouragement and high-fives. The M760i feels like a car for closers. What’s strange, though, is I can’t quite pin down what exactly it is about the M760i that makes me feel so impressive. BMW’s classic kidney grille doesn’t have anything like the monumental appearance of the grille on the Rolls-Royce Phantom. The 20-inch wheels are no bigger than on many other sedans. The subtle V12 badge on the C-pillar adds little to the car’s presence. But presence the M760i definitely has, the whole appearing as much more than the sum of its parts. The M760i is at once stately and athletic, the zenith of technology while representing last century muscle. 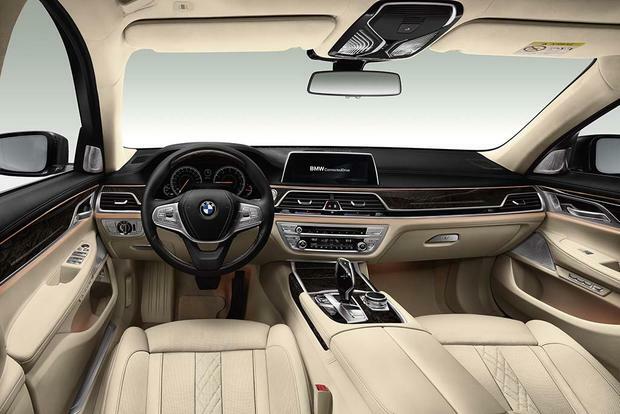 BMW launched its latest generation of the 7-Series for the 2016 model year, introducing impressive new engineering in its structure with a carbon fiber cell around the passenger compartment. 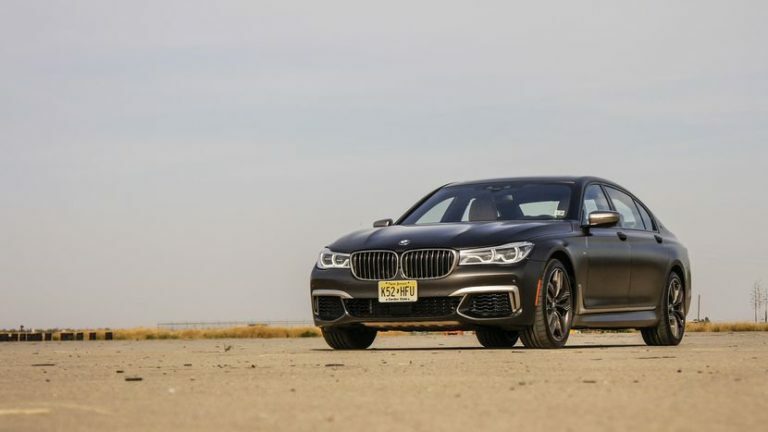 The M760i represents the top of the line for the 7-Series, incorporating a twin-turbocharged 6.6-liter V12 engine making 601 horsepower and 590 pound-feet of torque, powering all four wheels. BMW claims a zero to 60 mph time of 3.7 seconds. 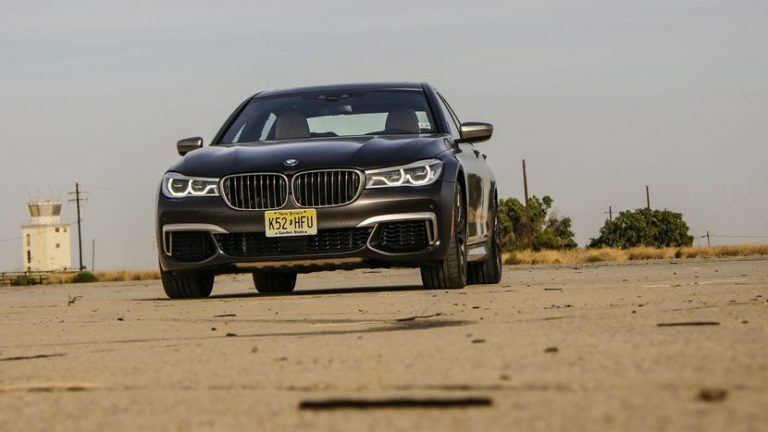 In addition, the M760i comes with rear wheel steering to aid in handling, and an adaptive air suspension that actually uses a camera to examine the road ahead and adjust the ride quality appropriately. However, the M designation in the name does not mean it is an M7, a model that doesn’t exist but would presumably have the high-performance characteristics of an M5 or M6. The M760i, with its somewhat elevated performance and M styling, is what BMW calls an M Sport Edition. What first strikes me about the M760i are the plush seats in the roomy, comfortable cabin, thanks in part to the $4,000 Cashmere/Merino Beige interior package. A glance towards the rear makes it clear that I made a terrible mistake in not bringing a chauffeur, as this M760i also came with the $1,800 Luxury Rear Seating package. Not only do the rear seats adjust, they also have massage, plush little headrests, screens tied into the car’s infotainment system, and an Android tablet in the center armrest. As a practical bonus, the armrest lifts so three people can still fit in back. 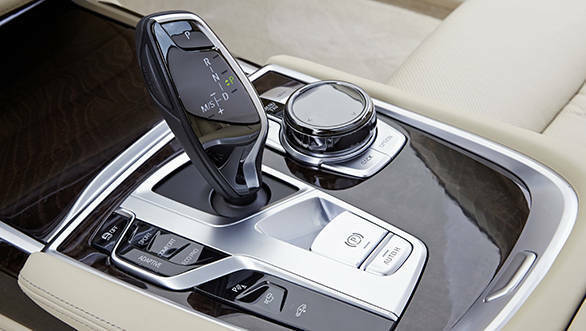 All around the cabin, solid metal switchgear with a satin finish echoes the quality of the M760i. With the phone-sized key fob in my pocket, I start up the big M760i. The V12 idles very quietly, but when I give it some throttle it responds with a low, sonorous rumble, and I don’t believe 601 horsepower ever came on so smoothly. The console holds a selector for the drive mode, which includes Eco Pro, Adaptive and Sport, the shifter for the eight-speed automatic transmission, and dial for the infotainment system, shown on a wide, 10.2-inch LCD in the center dashboard. In front of me, a 12.3-inch wide LCD shows virtual gauges, and changes its look depending on the M760i’s drive mode, with blue for Eco Pro and red for Sport. And above that, projected on the windshield, I’m looking at the full color, high-resolution graphics of an impressive head-up display. As a big sedan designed for the Autobahn, I bring the M760i to the fastest public road near San Francisco, Interstate 5 through California’s Central Valley, limited to 70 mph. 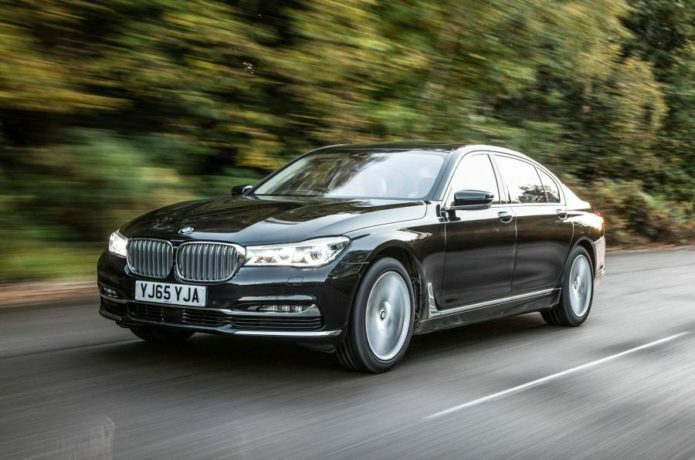 In either Adaptive mode or Eco Pro, the M760i moseys along, clearly capable of much greater speed, but incredibly comfortable just cruising along. I can feel the suspension move under the car as it deals with the road, but the ride quality is superb. I barely feel the miles, and would love to just continue on and on. This example lacks the upgraded audio, a 16-speaker Bowers & Wilkins system, so I have to make do with the standard 16-speaker, 700 watt Harman Kardon system. I’m not exactly suffering, and the serenity of the M760i’s cabin enhances the sound of music from the stereo. I never tire of adjusting the volume with the gesture control system, which requires a little twirl of my finger in the space over the console. Aiding my freeway comfort, the M760i comes with adaptive cruise control and lane keeping assist, the latter twisting the wheel in my hands to maintain its position in the lane. With adaptive cruise, the M760i matches speeds with slower traffic ahead, showing me its set speed and following distance on the head-up display. It works well in stop-and-go traffic, too. My only complaint comes when other cars cut in front of me, due to the M760i maintaining a safe following distance when traffic is running at moderate to fast speeds. The calm of the freeway lets me explore the M760i’s infotainment system, iDrive 5.0 in BMW nomenclature. The dashboard LCD is actually a touchscreen, but using the dial and buttons on the console comes easy enough that I don’t feel like stretching forward. I note that BMW simplified the main menu, cutting it down to six icons from eight previously. The M760i’s maps looks good, showing 3D-rendered buildings in the city and topography in the country. I’m happy with its quick, one-box online destination search and note the plethora of third-party apps that sit at the ready to help me. I could pore through Yelp listings to find a good restaurant, then dig through the parking listings, which show the number of available spaces in garages. For audio options, the M760i gives me online streaming media, USB ports, Bluetooth streaming, HD radio, satellite radio and even 20 gigabytes of onboard space if I wanted to take the time to load a bunch of music. The M760i supports Apple CarPlay, but not Android Auto. Luckily, I use an iPhone so can take advantage of this feature. Even better, I get to experience the miracle of wireless Apple CarPlay, as the M760i supports it over Bluetooth. Only BMW has this capability currently, as all other automakers require you to plug into the USB port. A two hour drive drains my iPhone 6S battery by half. Comfortable cruising is all fine and good, but this BMW has an M in its name, not to mention the massive power from its V12. I take it up to an appropriately twisty mountain road, and take advantage of the M760i’s ready acceleration to pass slower traffic before the fun stuff starts. With drive mode and shifter set to Sport, the engine keeps the power up as I take the turns. But I quickly find that the M760i’s adaptive suspension refuses to firm up enough to hold it flat. Even with rear-wheel-steering, the M760i doesn’t feel nimble. I get the tires squealing in the turns, but the handling technology doesn’t altogether mitigate the size of this sedan. Frankly, I’m a little disappointed, and have to remind myself that there is no such thing as an M7, just this M Sport Edition of the 7-Series. However, I can take some heart in that, even given the EPA fuel economy of 13 mpg city and 20 mpg highway, I manage an average of 18.3 mpg, even with some brutally slow city traffic. Despite the 2017 BMW M760i not being quite an M level car for sport driving, it still handles well. However, it really shines during the long, freeway cruise, where its comfortable ride will deliver you to your destination fully relaxed. Beyond the driving characteristics, the M760i carries an impressive technology load. I was thoroughly pleased with its displays, including the head-up display. The new iDrive proved easier to use than previous versions, while still offering loads of useful features both connected and onboard. Wireless Apple CarPlay adds a little icing on this Bavarian cake. Faced with its arch-competitor, the Mercedes-Benz S-Class, it’s an extremely hard choice between the two. The S-Class also delivers an extremely comfortable, relaxing ride. In BMW’s favor, I find its connected features more seamlessly integrated with the infotainment system. Sometime next year, both of these big sedans will have to contend with the new Audi A8 and Lexus LS 500. The A8 in particular will bring to bear Audi’s Virtual Cockpit technology and new driver assist features which put it well on the road towards self-driving. When it comes to optioning the 2017 BMW M760i, that Cashmere and Merino package makes for a nice cabin, but I would likely be content with the standard Nappa leather. The Driving Assistance Plus package, at $1,700, is a bargain, as it brings in adaptive cruise control and lane keeping features that can nearly drive the car itself, especially in stop-and-go traffic. The Luxury Rear Seating package, at $1,800, is also cheap, but only makes sense if you plan on carting people around on the regular. As a music lover, I would add the Bowers & Wilkins audio system — pricey at $3,400 but probably worth it. All told, with the car’s base price of $153,800, destination fee of $995, and Gas Guzzler Tax of $1,700, we’re looking at $161,595. To be honest, I would be more interested in the BMW 740e iPerformance, the plug-in hybrid version of the 7-Series. It’s available with most of the same equipment, but bases at $90,700. Although down to 322 horsepower, it achieves 64 mpg equivalent in EPA testing. Or consider the Alpina B7, a slightly different take on the 7-Series with a V8 engine.